Citizens of Tremont in Cleveland, Ohio, be prepared for a little laugh at my expense. I admit, that up until very recently when I researched the history of this Classic Revival structure, I thought for sure it was originally a residence. However, I now hold the correct information. It was originally the Olney Art Gallery, just as it is printed over the doorway. Yes, thank you, you can stop laughing now. For those of you who don’t know (as I didn’t) the Olney Art Gallery was constructed as the first public art gallery in 1892 (opened in 1893) by Professor Charles Fayette Olney and his wife Abigail. They were married in 1887. Abigail was first married to Thomas Lamson, co-founder of the Lamson & Sessions company. Abigail and Charles had the gallery added onto the Lamson home. 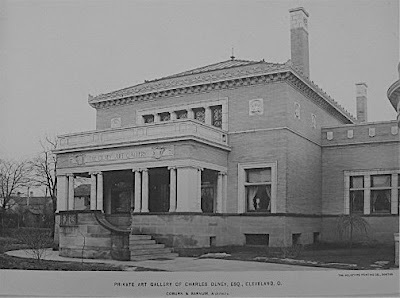 The structure for the art gallery was designed by Coburn and Barnum, a firm that also designed over twenty houses along Euclid Avenue's Millionaires Row, several buildings for Case Institute of Technology, Western Reserve University, and Oberlin College, as well as many more around Cleveland and in other parts of the country. I found the following historic exterior photo here, a blog that the Restore Tremont group directed me to for information. Notice the fantastically high ceilings and what appears to possibly be a skylight in this interior photo from the Encyclopedia of Cleveland History. Professor Olney passed away in 1903 and Abigail passed the following year in 1904 at the age of 74. 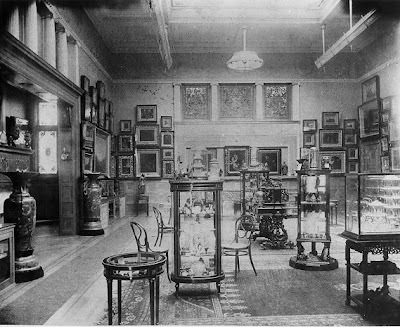 The gallery stayed open until 1907. When Charles died, he left the majority of his collection to Oberlin College. The Cleveland Museum of Art opened to the public nine years later in 1916, so Clevelanders had to wait a little while until fine art was again available for public viewing on a regular basis. Once the gallery closed, the structure passed through many hands through the years, serving as a Ukrainian hall and a Puerto Rican hall, and finally into the hands of Grace Hospital next door. Grace Hospital also owns the residential structure in between the gallery and the hospital (2267 West 14th St.). They have owned these properties since 1990. It is the intent of Grace Hospital to return these structures to their former glory. So much so, that they have asked for the assistance of a local architectural firm that specializes in historic preservation. As this article indicates, in 2007 the hospital received a portion of what would be needed for restoration. The rest at this point is delayed with the economic downturn that has affected so many other projects in the Cleveland area. The hope is to create a wellness center that would make the local Tremont community proud. As soon as it is possible for the project to get back on track, the hospital plans to get started. However, if it does not get started soon (within six months to a year) the hospital hopes to improve the exterior appearances of the structures. Before I learned of the anticipated plans for the structures by Grace Hospital, I was considering some potential re-use possibilities. One would be dependent upon ODOT doing what I consider to be the right thing, and add a pedestrian/bike path alongside the new Innerbelt Bridge. With a safe and easy path letting out directly onto West 14th Street from the scenic bikeway, these structures could serve the community and tourism industry by housing a bicycle sales/rental location as well as a welcome center offering walking/biking maps highlighting local stops of interest. The Gallery could be restored to a health food or vegan cafe, which I think would all tie nicely into the plans for a wellness center. Great information. Wonderful to hear that the owner sees potential and is working toward it. The downturn will eventually pass. Please provide a street address so I can "fly to" Olney. Excellent question. 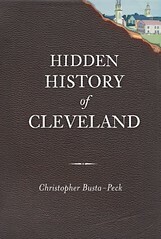 The gallery itself is located at 2253 West 14th Street, in Cleveland, Ohio. Grace Hospital needs to move fast as a neighbor of the Olney Gallery and Lamson House they are quickly falling into disrepair. This is especially sad for the Olney Gallery with its beautiful exterior. I know things are tough all over but there has to be better options than Grace hospital as the owner. These are historic landmarks and should be treated as such. Someone from the Historical society or even the Cleveland Museum of art needs to step in and take control. Way too beautiful to be lost. I could not make out the Olney on the front so I stepped closer to try and read the sign , only to get chased off the property by some employee from Grace today. Any update on what Grace is going to do? The building is beautiful! It would be a shame to use this as part of the hospital as it such a historic landmark and should be treated by the Historical Society or Cleveland Museum of Art as a number one project and restore both the Olney Art Gallery and the Lamson Home as soon as possible. Land is at a premium in Tremont which is a historic area in itself and this would be an excellent historic project!!! Happy to say that the restoration of olney and the higbee house has begun! It is such a shame to think that this will be turned into a 'health spa.' Someone who has the power to restore this gallery to what it was actually intended for needs to step in. The interior of the gallery is in terrible shape but as you walk through it you can SEE the beauty. It should either be renovated into a gallery again or let someone buy it to renovate as a house. It is too good for the Grace Center to own.